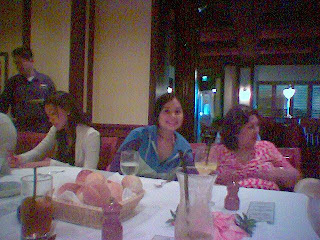 Guam was like a family reunion for me.. i have loads of cousins and little newphews and nieces who live in guam.. I also have a very good japanese dive instructor who happens to own Papalagi dive shop in guam and a chain of dive shops in tokyo (he was in tokyo when we were in guam.) Anyways the trip was special because of family. Il post family pictures as soon as i get copies. The metro pacific group (producers of the show) treated us like family too!! It was cute to see the group which is composed of married men, be the leaders of the whole project. The wives really supported thier husbands. Truly, the show was a sucess because there was a flow of authority and unity within the group. 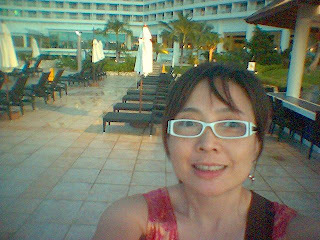 We stayed at the Sheraton Resort Hotel! It was great! The food was super yummy and the place was so nice and clean.. we thank the metro pacific guys and wives for taking care of us. 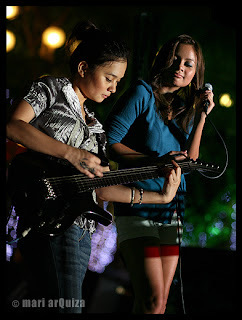 Our gig with Sittie Navarro was a unique exprience.. just mixing Bossa and Pop-rock was a feat. imagine the crowd when Sitti was playing and then Kitchie.. its was different because 1. there was no violent reaction from the crowd. 2. the crowd enjoyed both experiences from the oldies to the kiddies.. it was a "global like" affair in terms of music clashes. Im looking forward to more posting of pictures.. during the show. Im just waiting for the copies. :) i post it when i have it!